You may believe there is nothing better than the sweet, nutty taste of creamy peanut butter coated in a thin and “crispity” chocolate shell, mmm… Reese’s Pieces. However, how many of you mindlessly eat half the bag of this nutty candy, glance at the ingredients label lackadaisically, and then shriek as if you saw a zombie clown with fluffy red and blue hair pop out of your closet… Gah! The thought of either happening to me, makes my skin crawl, that’s for sure! Thankfully, I have slayed the former issue (as for that zombie clown ghost… Well, perhaps Buffy the Vampire Slayer knows a thing or two about zombies) by creating Reese’s Pieces’ healthier twin, that doesn’t contain the sugar, trans fatty acids and artificial coloring that are all known to cause heart disease among a massive list of other ailments. My “clone” also doesn’t contain peanuts, so for all of you who feel left out of the Reese’s Pieces party due to allergies… I’ve got your invitation so you can get back into the mouth-tivities! Well hello there! It’s GiGi of GiGi Eats Celebrities and the recipe I conjured up (who else is thinking of the movie Hocus Pocus right now? ), thanks in part to the fact that Halloween is just a few days away, will blow your mind yet won’t blow your diet, at all. 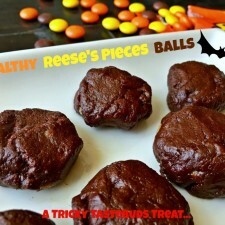 You see, the ingredients in my healthy Reese’s Pieces recipe, which includes Kelapo coconut oil, vegan protein powder, sugar-free dark chocolate, and the herbal sweetener, stevia, all contribute positively to your health and unlike the typical ingredients in Reese’s Pieces, won’t increase your likelihood of obesity, diabetes, cardiovascular disease or the like. 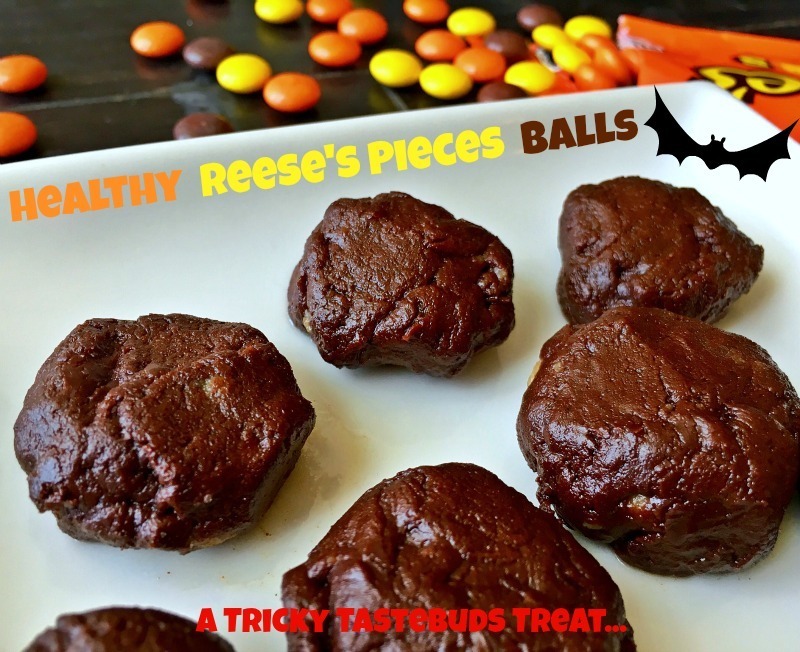 You may think this is a trick, but I can assure you this is just a treat that you can eat copious amounts of, without getting spooked by the ingredients label. Combine the protein powder, coconut oil, coconut flour, water, and flavor concentrate and mix together. Form tiny balls (ball size is completely up to you… Big balls, small balls… They’ll all taste the same). Heat a saucepan over medium heat on the stove. Add dark chocolate and let melt. Add coconut butter and flax milk and stir. Once chocolate is melted, remove from heat, let cool for a few minutes and then… Bombs away! Dip balls into chocolate and set on parchment paper, a plate, tin foil, or wherever, so they can dry. I recommend once you’re done choco-fying your balls, you place them in the fridge or freezer so they can harden a bit. Lick your saucepan clean… So as to not waste any chocolate and to whet your appetite for the main event. You know what? I don’t think you even need to consult Buffy in order to figure out how to slay that Zombie Clown… Because I have a feeling, if you shared some of these pieces with him, he’d happily be your plus one to that Halloween party you’re attending! yumyumyum, comin over from Gigi’s blog to look at the delicious recipe and say hi! Thank you for checking out this delicious recipe! Hope you liked it!